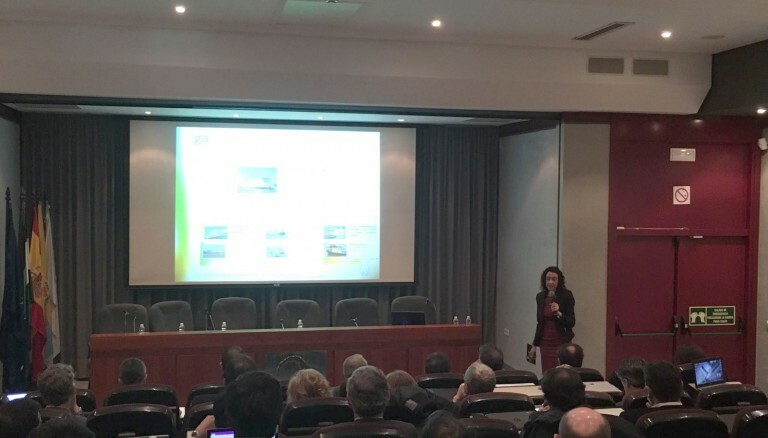 February 26, 2018.- Last week Eva Pérez, the general coordinator of the GAINN4MOS and GAINN4SHIP Innovation projects, participated in the “Joint Working Group Meeting on Ports and Multimodal Terminals. Atlantic and Mediterranean Core Network Corridors”, held at the Conference Hall of the Port of Algeciras Bay. The workshop, which was opened by Manuel Morón, Chairman of the Port of Algeciras Bay; Carlo Secchi, the Coordinator of the Atlantic Corridor; and José Llorca, President of Puertos del Estado, included a session about “LNG in Atlantic and Mediterranean Ports”. In this session, an exchange of experiences between the projects that are being developed to foster the use of LNG as marine fuel in the Mediterranean and Atlantic ports took place. During this part of the workshop, Eva Pérez presented an overview of the all the GAINN initiatives. The event was a great opportunity to discuss with other LNG project coordinators and present the results achieved so far within the framework of the Atlantic and Mediterranean Corridor Forum Meetings.